I used to live in Westminster, and I went there once during the moving in process. I recall not being blown away, but that was years ago, and Jim's BH gets pretty good reviews. Plus it was sort of on the way to the airport today. I ordered and in the time that it took to play the second best song in the world* (which was playing) , my double cheese burger and rings were ready. 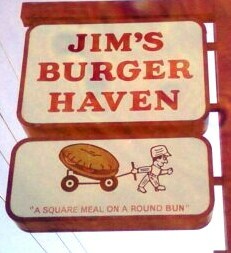 Note that I asked for them to toast the bun, since this seems to elude all Denver burger establishments. What I got was a splayed hand-sized burger--friggin' huge but oddly flat. The patties were razor thin. That meant Well Done, like it or not. They used double cheese, so it was satisfyingly gooey. Sadly, they didn't hit it with salt and pepper. 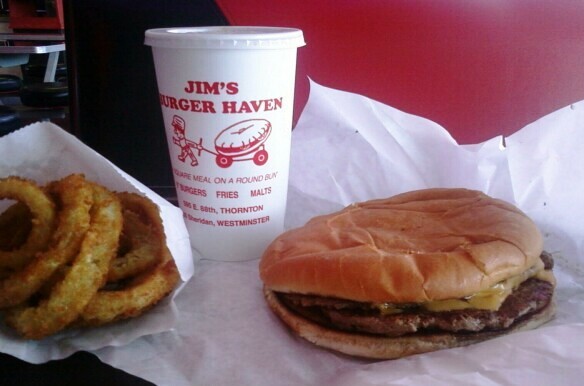 The burger did have a nice iron flavor, which sort of stayed with me, but that was no substitute for proper seasoning. The bun--it was big, but the ratio was spot on with the double. BUT........it fell apart...it was not up to the task. The fryer oil was stale, so the rings tasted burnt....meh. Burger Review -- Better than HBurger....still..meh. * The second best song in the world is The Girl From Ipanema as sung by Astrud Gilberto and accompanied by Stan Getz. The best song in the world is The Girl From Ipanema as sung by João Gilberto and accompanied by Stan Getz.